Until now, summer in Berlin was a sour-sweet joke, with full days of rain ending up romantically with awesome sunsets. People living here for more than 20 years complain that this was the worse summer ever, but optimistic people like me still give good weather a chance in the next month. However, rain or not, the fancy restaurants keep going on with their schedule and the menus offer special summer treats, such as the ice coffee, which I honestly don't mind to sip it all round the year. But, I rarely have the chance to have one in January or even April, although I dare to ask more than once, taking the risk of being stared as an excentric unadaptable creature. Compared to the 'real' coffee, there is something I always associate with an ice coffee - can I have it, please, really cold, topped with cream, with some sprinkles of cocoa if possible (coconut shreds are also a good idea), with the icecream softly melting and taking over the sourness of the coffee: people watching. 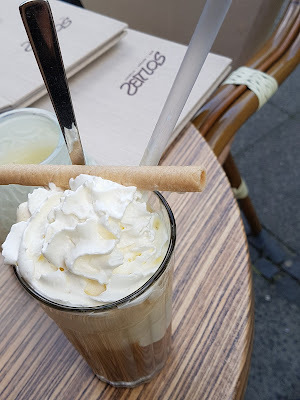 I love to indulge once in a while something sweet and diabetically addictive, while leaning on the summer chairs on my favorite part of Berlin: the fancy Kürfurstendamm (Kü'damm). From tourists to old and new Berliner, the entire social network of my beloved city is running back and forth, faster or in slow tempo, in the front of me and my excentric glass of ice coffee. For those sharing the same secret temptations, I bring you my favorite spots on Ku'damm. If someone, anyone, ever needed a proof that my life is anything else but series of coffee hopping, here you have the proof. The average price of one ice coffee is around 5.50 EUR. Opposite Halensee S-Bahn station, at no. 115, near Henriette Platz, there is a West Berlin ice coffee institution: Eisgrün Eis-Café. Open until 22.00 during the summer time, it has a huge offer of delicious icecreams many of them easily added to the special menus. I am trying to visit this place at least once the year, for one full lazy hour of people watching. This time, I ordered Mocca d'Oro: a shot of espresso, with vanilla icecream, cream liqueur and a lot of cream, plus some elegant sprinkle of cocoa on the top. The best answer to a sweet tooth. A couple of meters away, there is time for another delicious spot: Zeitlos (timeless, in English) cocktails bar. I never been there before until this yeaar, as I was assuming it is too touristic, but my curiosity about their ice coffee was too big to resist. The ice coffee is not on the menu - which has a lot of temptations of summer fresh cocktails among others -, which means that there is only one single type of it. It has the vanilla icecream, and the heavy whipped cream and you need to mix them slowly until they are one with the sour cold coffee. A moderate experience, but a good threat for the summer. After soo much sweetness, that infused your body with energy too, you dare to walk a bit more, until the Häagen-Dazs elegant store, at the ground level of the famous 4-star Hotel California. There is another similar store, but smaller, at the very beginning of Ku'damm, direction Zoo, and another one, where I had my first salted caramel ice coffee a couple of years ago, in Hackischer Markt. I love the view there, and the ice coffee offers the usual combination which you can make it even sweeter ordering one of the many icecream sweet - or very very sweet - crunchy combinations. Every time I go to the outdoor terrace, the service was quite messy, but the street view has a calming effect while waiting to be brought the right or the slightly delayed order. Reinhard's by Kempinski is my favorite place to an stay a bit longer than usual, watch and elegantly sip my ice coffee. This year, the ice coffee seems to be a bit less successful than in 2017: something happened with the coffee taste which was less rich that I expected, but maybe it was a bad coffee day when I visited. Therefore, I have to give it at least one more try, until the summer is over. On the other side of the street, Hard Rock Cafe is always busy with people waiting in line in the front of the entrance, especially in the summer. Especially if you want to seat outside, on the terrace, expect some delays unless you want to make a reservation. They do have the classical American ice coffee - which is cofee on ice - but also some Irish cream whisky sortiment. Last but not least, a spot which I don't fancy for the view - actually it has the worse view - and looks pretty cheap, with its plastic red chairs: Europa Center. The ice coffee looks and tastes good and the service is pretty fast. I particularly loved the good balance between the sweetness of the whipped cream and the sourness of the coffee. And it is as cold as you expect it after a whole day of summer heat. Which summer heat, I am still looking forward to it, probably in August. Since it's a hot humid day here, and I'm in need of some caffeine, this is a post to drool over. I loved wandering down the Kudamm, but I never knew where to go for a break. Now I do. Thanks. I hope you can make it back soon and who knows, we can have a delicious ice coffee, or even two, together! Looking forward to it! I always love a good coffee post, and since Berlin is on my list for this winter, this is perfectly timed! Maybe not iced coffee in January, but slipping into a cozy cafe sounds pretty ideal! A cozy coffee all round the year is the best-case scenario! You can find so many of them in Berlin. If you need more info about tips, don't hesitate to contact me! Happy summer travels!